In Capricornus, we began the second Book of this star revelation, and in this book we are discovering the abundant blessings that are ours in Christ — in THIS lifetime — not just in eternity. With Aquarius, we will see exactly HOW these blessings become ours. There are few myths that come to us concerning this sign. Although, the one myth connecting the man with the cup-bearer to the gods is universally famous. The Arabs always thought of this region of the sky as the most fortunate of all, thinking it was somehow connected to the good favor of the gods. It is, in fact, an amazing picture of the one, true God’s good favor toward us! The picture here is of a man who is kneeling (or squatting) as though one of his heels has been bruised. Remember the Seed Prophecy? (Genesis 3:15) Remember that after we see Christ represented in Ophiuchus who was stung by Scorpio in the heel, we will not see Christ represented again without noticing that he is kneeling. Even as represented by Sagittarius, the two-natured beast, He is seen lifting a heel. The kneeling man is thrusting one of his arms into a water pot (urn) while holding the pot in the other hand. From the other end of the pot flows a river of life for the southern fish. Without this connection to the man, the fish would most certainly die. The grace of God is represented here by His provision of an abundant life here and now — and not just in eternity after our deaths. The blessings that were promised to us are made sure by our union in Christ. This is the great mystery that was hidden from the prophets until Paul’s time, but it was always in God’s plan. Just like the fish in this picture, we live because of Christ living in us. 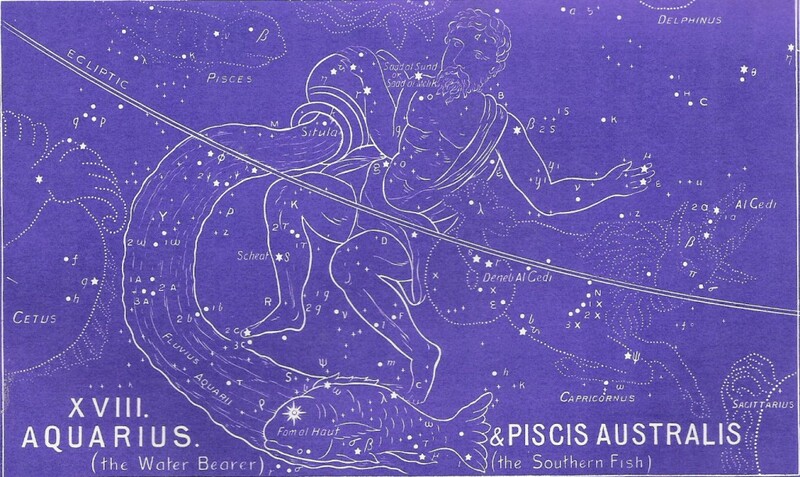 To continue in the correct order of the ancient star chart, please select the Piscus Australis menu option.